The NASA/ESA Hubble Space Telescope has captured a spectacular image of NGC 3603, a giant nebula hosting one of the most prominent massive young clusters in the Milky Way, thus supplying a prime template for star formation studies. 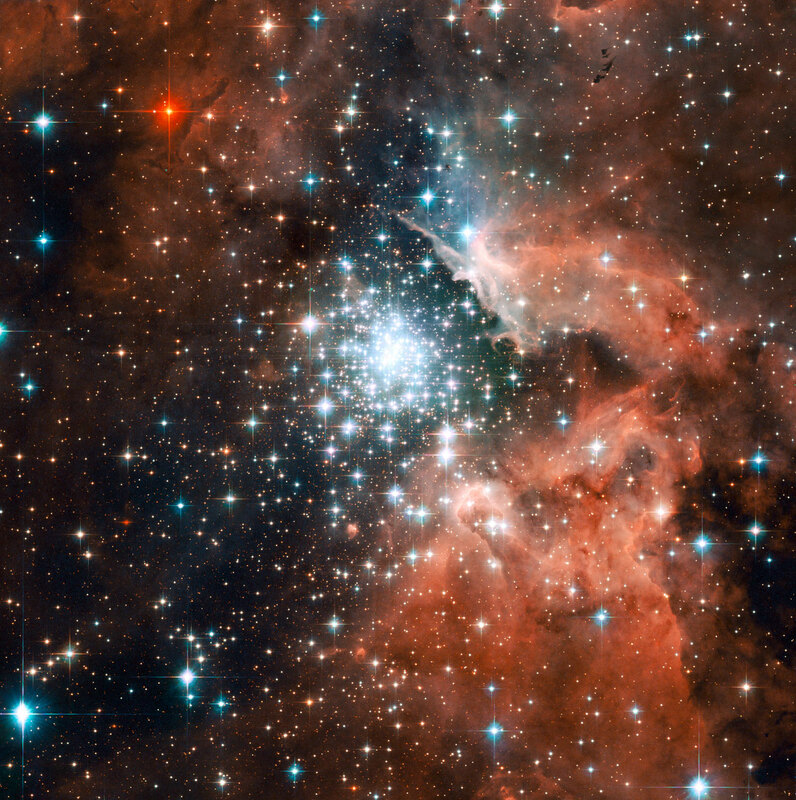 NGC 3603 is a prominent star-forming region located in the Carina spiral arm of the Milky Way, about 20,000 light-years away from our Solar System. 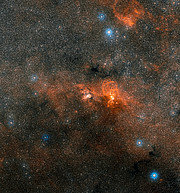 This latest image from the NASA/ESA Hubble Space Telescope shows a young star cluster surrounded by a vast region of dust and gas. Most of the bright stars in the image are hot blue stars whose ultraviolet radiation and violent winds have blown out an enormous cavity in the gas and dust enveloping the cluster. 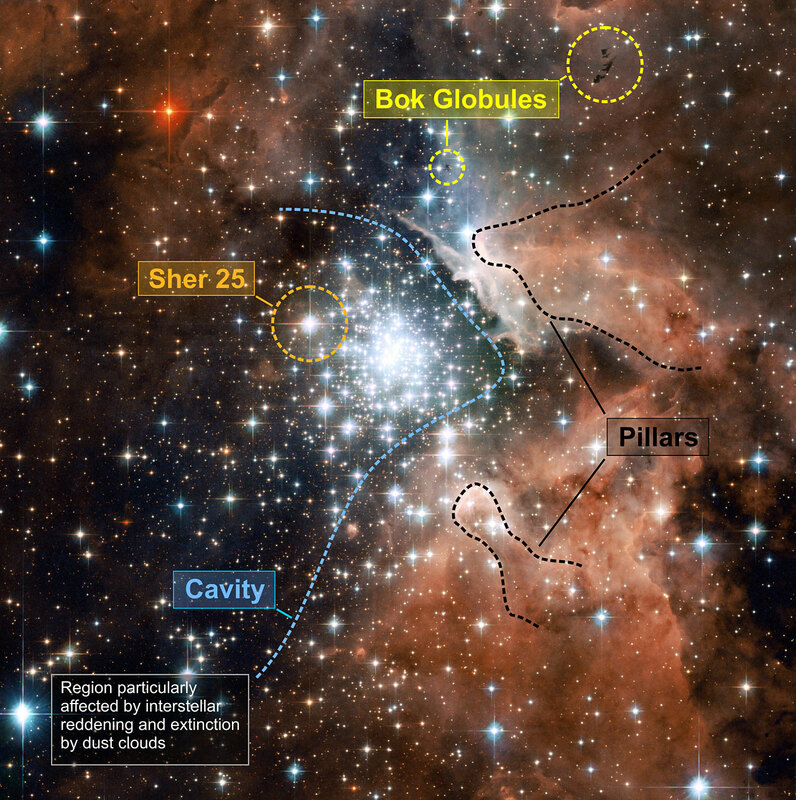 The new Hubble image provides a snapshot in time of many stars with differing masses but similar ages inside the young cluster. This allows for detailed analysis of several types of stars at varying stages in their lives. Astronomers can then compare clusters of different ages with one another and determine which properties (such as temperature and brightness) change as the stars get older. According to astronomer Dr. Jesús Maíz Apellániz from Instituto de Astrofísica de Andalucía, Spain, who is leading the Hubble investigation, the massive star cluster in NGC 3603 appears to gather the most massive stars at its core. He and his team have discovered that the distribution of different types of stars at the centre of this very dense cluster is similar to that of other young star clusters in the Milky Way. The team has also found that the three brightest stars in the centre are apparently misleading us into believing that they are more massive objects than theoretical limits allow. These heavyweight stars may actually consist of two or maybe more individual massive stars whose light has blended together. Even with the resolution of Hubble it is not possible to separate the individual stars in each of the three systems. This finding agrees with a recent discovery by Dr. Anthony Moffat from the Université de Montréal, Canada, who used ESO's Very Large Telescope and Hubble's infrared NICMOS camera to measure the movements of the individual stars in two of the three systems. Dr. Moffat measured the largest individual mass to be roughly 115 solar masses, which is within the acceptable limits for conventional theory. The swirling nebula of NGC 3603 contains around 400,000 solar masses of gas. Lurking within this vast cloud are a few Bok globules (seen at the top right corner of the image), named after Bart Bok who first observed them in the 1940s. These are dark clouds of dense dust and gas with masses of about ten to fifty times larger than that of the Sun. They resemble insect cocoons and are undergoing gravitational collapse on their way to form new stars. Bok globules appear to be some of the coldest objects in the Universe. 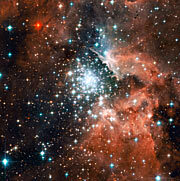 NGC 3603 was first discovered by Sir John Herschel in 1834. It is known to harbour a blue supergiant star called Sher 25 that can be spotted above and left of the densest part of the cluster. 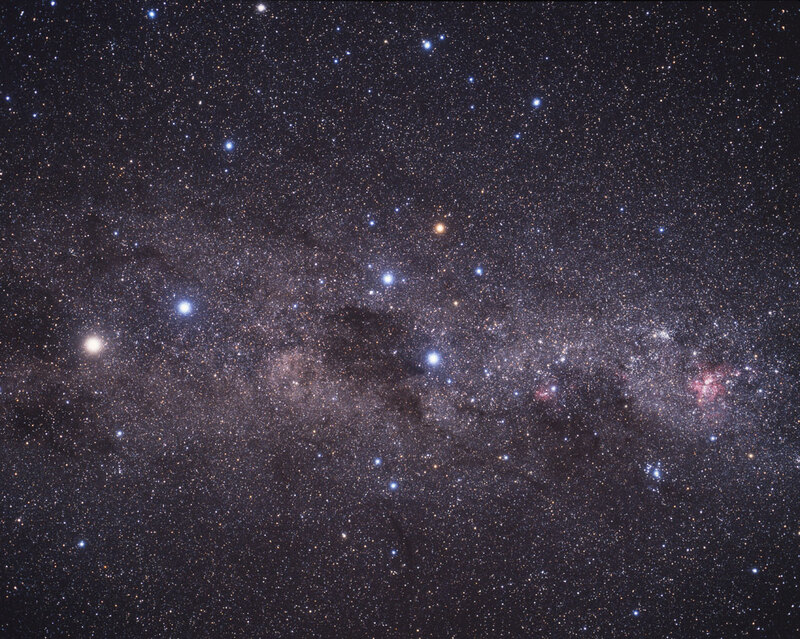 This star is believed to be near the point of exploding as a supernova and is often denoted as the Milky Way counterpart of the predecessor of the now famous supernova SN 1987A. A 3D panning (artist's impression) on NGC 3603.